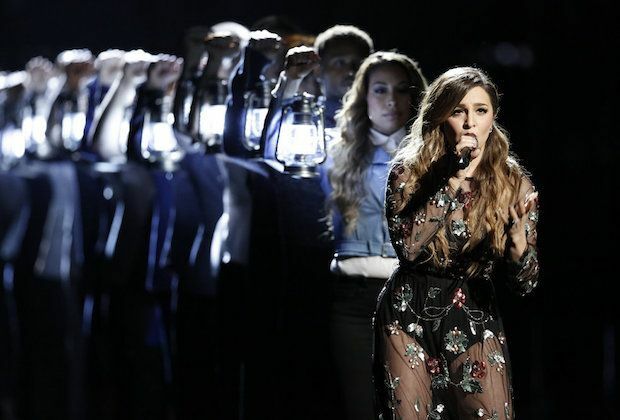 The Voice Performance Finale Recap: Girl, You'll Be a Winner Soon? One thing’s pretty certain following The Voice Season 10 performance finale: The song I’m most excited about downloading will probably rank last in iTunes at the end of voting (noon ET on Tuesday). What’s far, far fuzzier is whether the contestant with the strongest overall body of work/most impressive trio of Monday night performances — incidentally, not the artist whose song I’ll download first — can stand at the eye of the Coaching Popularity Hurricane (which is located at the edge of the Growth Arc Volcanic Precipice) (which can be found at the Song-Choice Downloadability Fault Line) and still take home the whole enchilada. The song in question is Hannah Huston’s electric, electrifying funk-pop jam “I Call the Shots,” a ditty she penned with Pharrell Williams that sounds like the kind of mainstream, Billboard-topping smash the likes of which no Voice finalist has ever been gifted (not during his/her time on the show, anyhow) but is in no way a great vocal showcase. Still, keeping it really really rlly rrrll — ugh, sorry, I spend too much time on Twitter — Season 10 belongs to Alisan Porter. Or at least it should. Will folks fire up their iPhones and download her exquisite rendition of Broadway’s “Somewhere”? Will they find it in their hearts to vote for the sole remaining contestant coached by the show’s least warm and fuzzy (but also least cloying/phony) panelist? Will the Power of Blake compel fans to reward the country dude with a tone as good and tingly as Ben Gay on a fatigued muscle (but whose charisma/enunciation still need work)? We’ll know in a little more than 24 hours. ‘Til then, allow me to present my grades for all three rounds of competition (they’re listed chronologically in the poll below — should you want to know who got the Pimp Slot)!